Instead of publishing a monthly “blogging income report” like many bloggers do (to document their online business income), I’ve decided to do things a little bit differently. 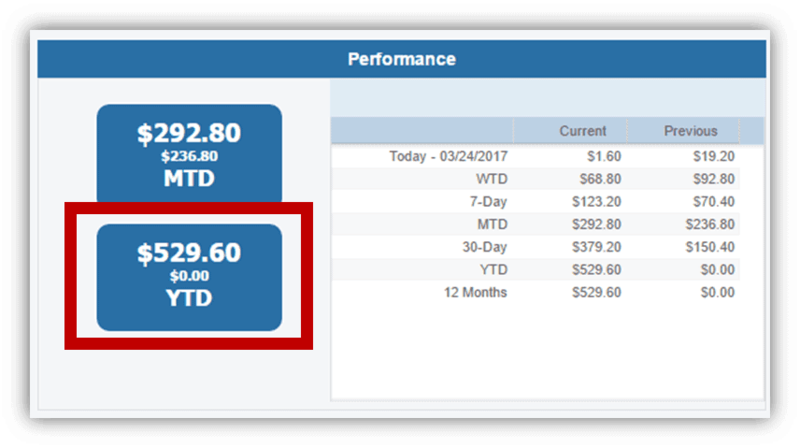 If you’re at all familiar with online income reports, you probably know that they can get a bit boring and repetitive. That’s why I’m only going to post them when I have some new insights I want to share with you all. Otherwise, I don’t see much point in sharing with the world our monthly online business income. They won’t be monthly. And probably not even quarterly. Basically, I’m just going to post them whenever I feel like it. Ben and I have been running the personal finance blog over at VTX Capital (which we’ve since rebranded to DollarSprout) for almost two years now, and this blog for about 6 months (since October 2016). During that time, we’ve learned a lot about what all goes into running a successful blog, mostly via trial and error. In my opinion, we did too much trial and error in our first year. I think we would have been better off investing more time in learning from people who are already succeeding. We tried to reinvent the wheel, and it wasn’t working. Affiliate marketing is also known as Cost-Per-Action (CPA) advertising. This is a little different than display Cost-Per-Click (CPC) advertising (like Google Adsense), where we make a few cents every time someone clicks on whatever ad Google decides to display on our site for a particular user. Instead of receiving payment each time a visitor clicks on an ad, with affiliate marketing, we get paid only when someone takes a specific action after clicking an ad/link on our site. Those “actions” are usually defined as making a purchase or entering their email on an opt-in page. So how is this better than cost-per-click advertising (CPC)? The commissions are MUCH higher. Since we only get paid when our ads generate actual conversions, advertisers (the companies we’re marketing for) are willing to pay us a higher commission. Since they’ve made a sale or conversion that they would not have made had we not referred the reader, they have no reason not to pay extra for that. The one downside to affiliate marketing is that conversions are much harder to pull off than just getting someone to click on an ad. That’s why having amazing content is so important. It’s the backbone of any successful affiliate marketer. With great content comes high volume traffic and an engaged readership — the two key ingredients to generating serious affiliate revenue. The great thing about making money through affiliate marketing is that your earnings potential is virtually unlimited. The only limiting factor is how hard you are willing to work to grow your site. Impact Radius is an affiliate network that we use to promote some of our top partners in the section above. As you can see, our earnings have trended downward since late January. January is historically a very good month for personal finance related web traffic, so this was somewhat expected. We just switched from Google AdSense to Adthrive for our display advertising on March 3rd. So far, it’s been pretty awesome. Their system places ads on our site automatically, which frees up a TON of time on our end. Our revenue per 1,000 impressions (also called RPM) has gone from $1.87 with AdSense to now $10.79. Despite our traffic being down in February and March, we are making far more from display ads than we were in January. This is a really big development for our business. The takeaway lesson here: As online business owners, a lot of times we get caught up in trying to reach more people, create more content, and just do more. You should regularly take a step back and look at how you can maximize what you already have. 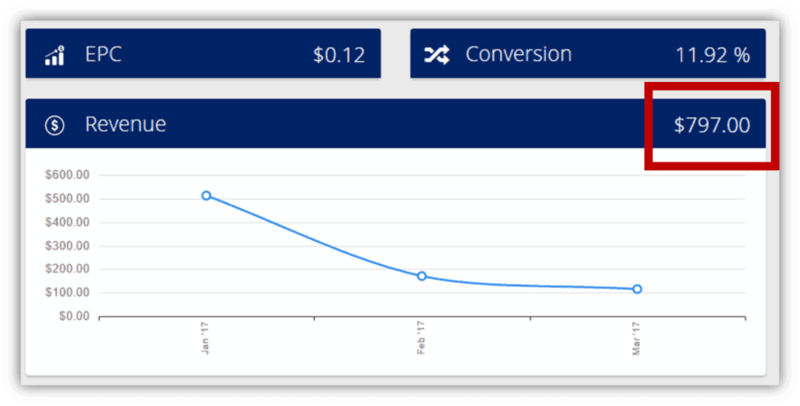 By taking what we already had (steady traffic), we found a better alternative to AdSense, and ended up 5X-ing one of our revenue streams. This is a network we use to promote one of our survey site affiliates. The particular program we promote runs on a single opt-in basis rather than double opt-in, and so far it seems to be performing really well for us. I’d like to start taking on more single opt-ins, as they are quite a bit easier to convert. Despite the CPA being lower than average, the EPC for this program is actually one of our higher paying ones. Our FlexOffers revenue continues to trend down as we are finding better places to work with specific partners. That being said, I still like them a lot. Our affiliate manager is always reaching out to see if we need anything, and she’s also good about letting us know of any new programs that might work well for us. CJ has always been a staple in our affiliate marketing lineup. We have never focused on them a ton (not for any particular reason), but it’s nice to have the extra income. We have several other smaller sources of income, which I have not listed here. Most of them are just a hundred bucks here and there. Over the last few years, and especially over the last few months, I’ve learned a lot about running and growing an online business. Ben and I have had our highs, and we’ve also faced a fair number of personal and work-related setbacks. We still have plenty of room for improvement. However, there are a few things we’ve picked up that I think can help you no matter where you are in your online business journey. 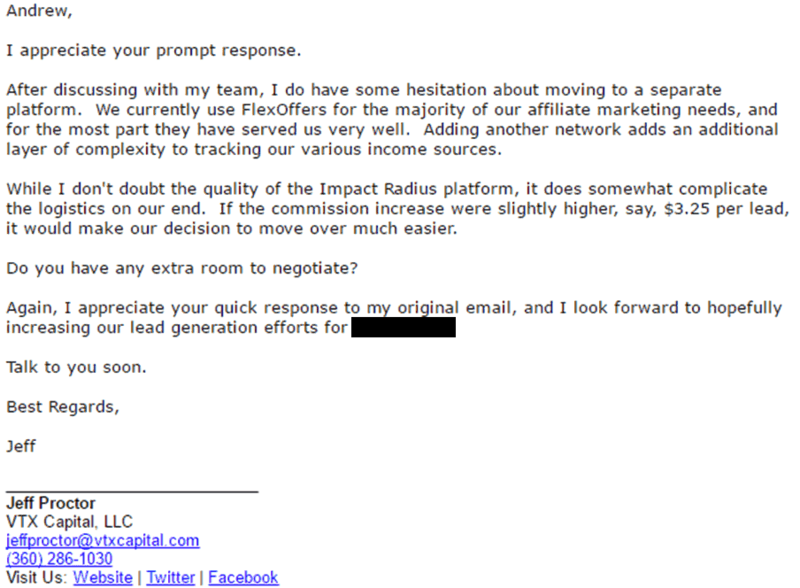 I want to share an email chain I had late last year with one of our affiliate managers, where I asked for a commission increase. I think a lot of blog owners are afraid to negotiate with their affiliate partners to increase their online business income. Negotiating takes us out of our comfort zone, and it puts pressure on the other party (when we are supposed to be working together!). But there are times when you just have to buck up and do it because there is too much money on the table not to. The below email thread is between me and Andrew, an affiliate manager for one of the best-performing companies that we promote. Note: I’ve left out company names for privacy. Great, they’re willing to bump us up from $2.80 to $3.00! 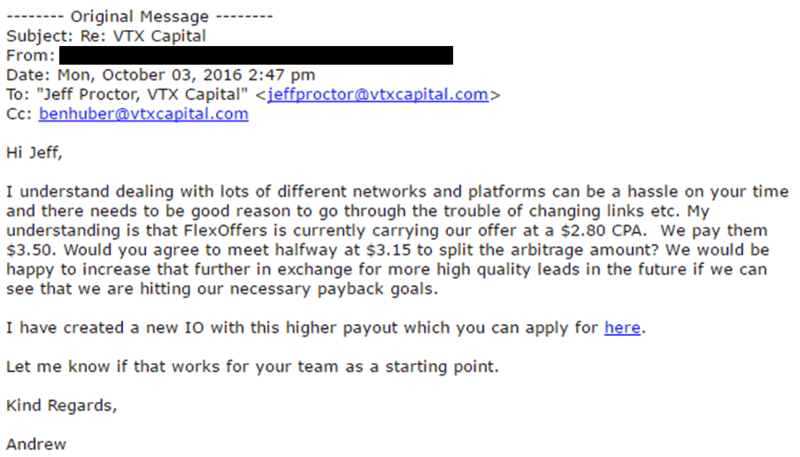 BUT his email actually gave me two little bits of leverage that I wanted to use to try and squeeze out a little bit bigger raise (yes, I know I’m greedy, and I am okay with that). You’ll see what I mean. He wants me to switch platforms, which creates a lot of extra work on my end. Registering on a new network, swapping out links in multiple articles, etc. It will take me time and effort to do the switch. Most people aren’t willing to haggle over a few cents, but I most certainly am. I’m thinking long-term: over the course of a year(s), every razor thin edge I can get goes towards our bottom line. 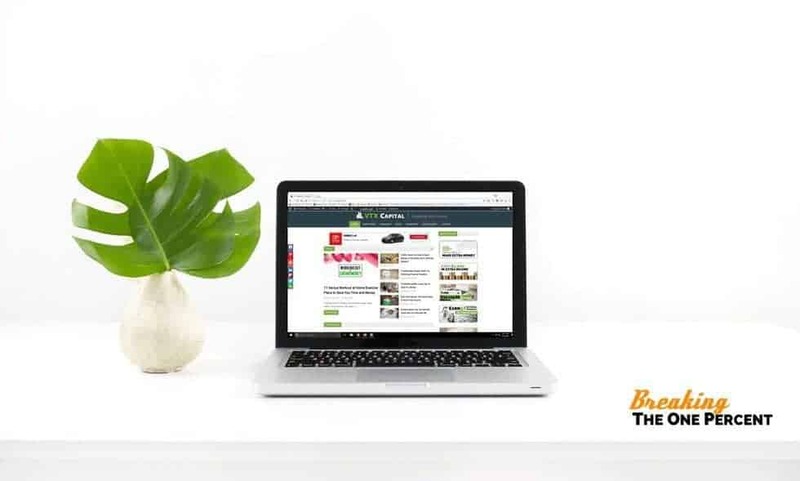 As we scale up our web traffic and increase our conversions for this particular company, this edge becomes a substantial dollar figure for us. And even if he says $3.00 is the best he can do, I still just locked up a 7% pay raise! A 7% raise from one email. Become comfortable in uncomfortable situations like this (straight up asking for more money). Boom. We’ve gone from $2.80 to $3.00, and now we are at $3.15. That was huge! In the end, this email thread ended up being worth well over $1,000 to us. And because of this thread, we will continue to make thousands more than we would have otherwise made. All from this one thread. 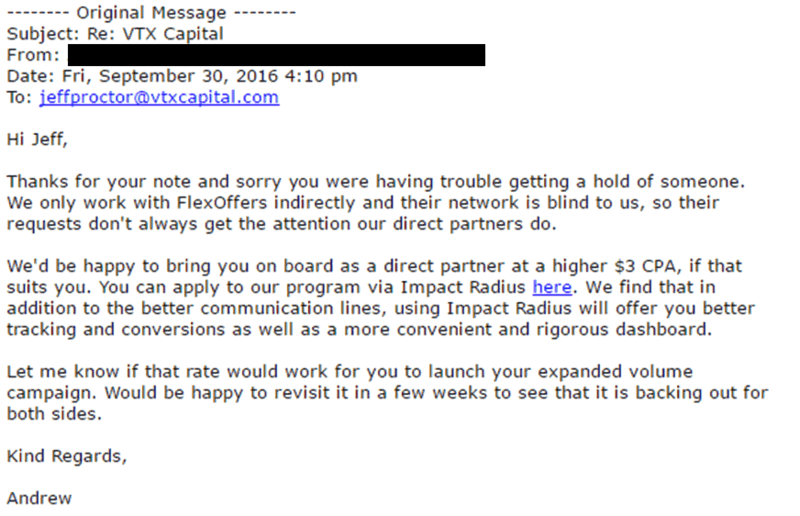 A couple months later (and after more positive results), I had a phone call with Andrew and was able to get our commission bumped again from $3.15 to $3.50. Sometimes all you have to do is ask. Don’t be afraid to negotiate. Taking the Plunge…We Hired an Assistant! Ok, so not a full blown “hire,” per se. But we have brought on a freelance virtual assistant to help us manage our Facebook pages. Keeping up with finding regular content to share on Facebook turned out to be too much for Ben and me to handle on our own. With little immediate return (both traffic and revenue wise) on our Facebook posts, we just never made growing our page a priority. Now that we have steady profits coming in from our other traffic sources, Ben and I are putting some of that money towards outsourcing certain things (like our Facebook pages). As much as I hate to admit it, we can’t do it all on our own! We’ve only started doing this now that we are running a strong profit each month. Due to the nature of Facebook (as a business page, we get very little organic reach with each post), I don’t expect to recoup the costs of our assistant for many months. However, building our Facebook presence is a non-negotiable part of our long-term social strategy, so bringing her on is still a worthwhile investment. In addition to our new assistant, we are also planning on spending just as much, if not more, each month on Facebook advertising to grow our following on both pages (VTX and BTOP). Again, this will have a very negative ROI at first, but it’s something we need to do. Colgate didn’t start selling toothpaste until almost 70 years after it was started. They originally manufactured soap, candles, and starch. Twitter started out as a podcasting platform. Amazon called itself “Earth’s Biggest Bookstore” when it first opened. Now they sell everything. Abercrombie & Fitch used to be a sporting goods outlet. My point is this: things change. Well, that plan didn’t exactly work out for us. We struggled to make any money at all, actually. Then we stumbled upon affiliate marketing and started learning how it works. Fast forward to now, and our business is almost 100% focused on affiliate marketing. While we still have a lot of room for improvement, we’ve become really good at what we do. The further down this path we go, the more likely it is that we do a complete re-brand at some point. 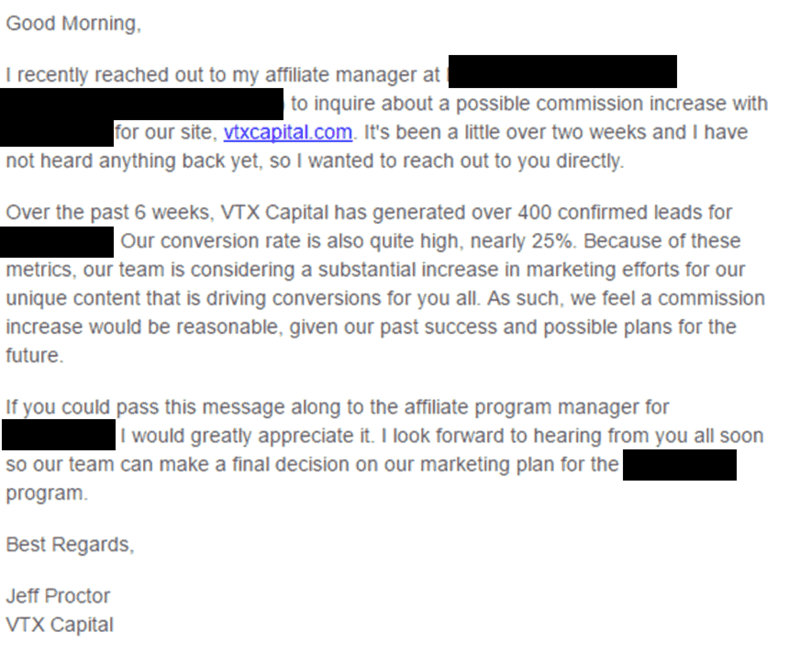 “VTX Capital” was the corporate name we first came up with for what we thought our business would be, but lately, it’s becoming more and more obvious that that name no longer fits our brand. And now that we’ve figured out how to succeed with affiliate marketing, we want to start aggressively pursuing other niches in the future, not just personal finance. That may mean creating one or more new websites, hiring content writers, and other business investments. We are slowly transforming from a financial education/coaching business to a media company, and I never saw it coming. Self-awareness is a very important skill in the business world — Ben and I are acknowledging that our original plans didn’t work out the way we wanted, but we are willing to double down on what is working. Even if it means something we never anticipated. Things are going really well for us, and I couldn’t be more grateful for the results we are finally beginning to see. It feels so great to finally know that I no longer need a regular day job to pay my bills and make ends meet. Trust me, it’s been a looong time coming. Really, I wish everyone could experience feeling this sort of freedom. Is it easy? Definitely not. I work on this stuff around 60-80 hours a week. Having a full-time job and working for someone else is easier, I promise you that. But it’s not nearly as fulfilling. And the income potential is a fraction of what it would be if you are able to create your own successful business. For me, the thought of making someone else’s dream come true while I clocked in and clocked out ate away at me every day I was at work. It finally got to the point where I could not take it anymore, and I left my cushy corporate desk job. Maybe that’s just how my brain’s wired. Maybe not everyone is like me. The purpose of this article was to show you that it’s possible. It’s possible to build something amazing (while you’re still working your 9 to 5). It’s possible to create a sustainable online income stream. It’s possible to leave your job and do something you love while working for yourself. I know so many of you are looking for a way out. Well, starting an online business and getting supplemental income could be your ticket. With our recent success, I’ve been getting a lot of questions from people about how to get started with something similar to what Ben and I are doing. The truth is, you can make a lot of money blogging, and you can make money with pretty much any niche out there. Cooking, DIY, Video Games, Yoga…really anything. If you’ve been thinking about giving blogging a shot, I’ve outlined the exact steps for you to get up and running in about 15 minutes. If you’ve already got your blog up and running and are dying to get more traffic, check out our course: Pinterest Design 101: How to Create Viral Pins that Drive Insane Amounts of Traffic (we get over 100k monthly visitors from Pinterest each month)! Great post Jeff! I love your blog and your stories are always inspiring. So happy to see the success you two have found in affiliate marketing! Thanks for sharing,this is really a motivator,although my site is still struggling to make income to talk of,im sure I will get there,I think most bloggers give up too fast because they are chasing the money so when the money takes time pouring in,they lose the interest. So true. Stick with it and keep learning every day, and you will be making money soon enough! Wow, you sure went into all the details!! Again, very inspiring. I’m looking to do the same thing with our blog – exploring affiliate networks, but also get into looking at selling our own product. Thanks for sharing Jeff – you have a new subscriber! First of all congrats on the success you have managed to achieve. I know that it took a lot of hard work to get there. It’s nice to see someone successful share tips with their readers. I’ve just started getting into affiliate marketing. While I am unfamiliar with some of the ones that you mention like Media Ventures and AdThrive, it seems like you’ve done very well with them. I’m like you, I find income reports boring. I would rather someone share what is actually working for them. Things they’ve learned or done to help grow their blog. I think this is more beneficial for their followers. I appreciate you sharing your experiences with us Jeff and I will definitely be looking into some of these affiliate programs you use. Thank you so much for the kind words, Susan! Like you said, I only want to share income reports when I have actual valuable stuff to share– I don’t want to get into the habit of re hashing the same stuff every month and boring you guys to death! Best of luck to you in growing your blog! Impressive number! Congratulations and thanks for sharing! Where was this article when I was first getting started? So helpful! And congrats on a very impressive 3 months! Congrats on your continued success. I love your income reports because they have useful tips. So many others just report the numbers. I’m hoping to step up my game. Currently, I’m getting a new theme (to speed things up) and minor redesign. I can’t wait to get my site “back”…it’s now been 2 weeks with no blog posts or edits/enhancements and it’s driving me crazy. Congrats on your commission increase. Congrats on the success! I love reading income reports and yours was no exception. I totally understand the whole journey with blogging and pivoting your end goals. I started as a freelance writer (still am) but have broaden my brand and business goals and am now a course creator and affiliate marketer! I find the backbone to making a living as a blogger or freelancer online is networking. I wouldn’t be here today with my relationships with other bloggers and influencers! Thanks, Elna! I definitely agree. Things really started to shift for us when we started viewing other blogs as friends rather than competition. Everyone is so willing to lend a hand! Impressive numbers! I’m glad your blog is doing well. And thanks for sharing! This is a great post! I started my blog and it is doing well. Question: Do you know if you can use the same affiliate links for two different blogs? Or it should be separately? Thanks! You should probably use different links, but I’ve not been great about doing that and still get credit for each site’s referrals. Thanks for the detailed description, have been reading your articles all morning and am definitely inspired!